ED. NOTE: Kansan QBAer Dan Bradley bought a Q-2 built by Ellis some months ago. In an unfortunate landing accident the plane was destroyed (he got out fine). Dan wants to sell off his wreckage, but he also wants to buy another flying Q-2. He is hot on the trail and has visited several owners. In a recent conversation we had, he told me that Evans' Q-2 had 175 hrs. of trouble-free operation and that Len Waters in east Texas was up to 250 hrs. with only a minor problem with a head bolt. This is good news for you Revmaster guys and you pilots with good first-hand experience should be sending me notes. Certainly several hundred Revmaster engines have been sold and there must be a goodly number working just fine. We just need to know the good/bad percentage to calculate our odds. That means we need the good news side of the story. Thanks, Dan, for a small piece of the data. I was able to set up and run my Revmaster on a test stand in my back yard. I have run it with prop for 20 hours during which I faced and solved a number of problems. I got the valves seated so the rocker arm gaps became stabilized, but the fuel mixture became the most vexing thing. Using an exhaust gas analyzer, I confirmed that at full load, full speed, the mixture went excessively rich. If I leaned it at full load, it was too lean to run at idle. Alan Horvath, Joe's son, was very helpful. He worked over the Rev-Flow carb and sent me a new set of intake pipes. Then, however, I found the mixture going too lean at full load! I checked for restrictions in fuel supply to the carb and was getting 12 gph. It finally dawned on me that the mixture control valve simply was not opening far enough and was restricting the flow at full demand. Rigging it to open a full 120 degrees or more solved the problem and my mixture stays constant throughout the entire load range. One Revmaster reference specifies a 95-degree opening and another shows 120. The 95 degrees will not work. How many other guys have failed to note this one? 1. Moving the elevator outboard slightly from the plans call-out will avoid elevator to fuselage interference. I used BL 20 to BL 92 and could have gone a little more. 2. Thin wall black plastic tubing, sold as drip-irrigation tubing, can be used as a conduit to run your brake line through the elevator slot core and into the wheelpant to exit by the brakes. The Nylaflow tubing fits just right but the bend at the wheelpant must be gradual for the Nylaflow to feed through without problems (cutting the end of the Nylaflow at an angle will help it feed through). I've had several calls asking for details on my swing away engine mount for my Continental, so here they are. A friend gave me a slightly damaged Cessna 150 mount and I used it to make mine without any extra material. 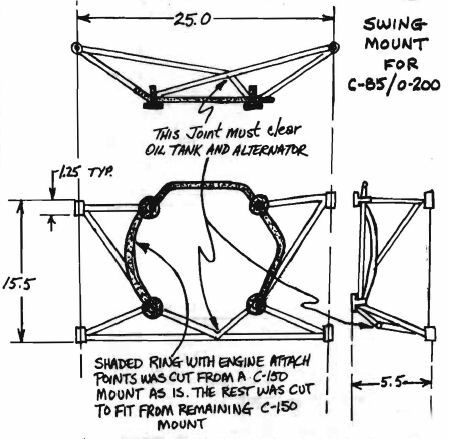 The center ring (shaded in the drawing), cut as is from the C-150 mount, will fit a C-65, 85 or 0-200. My engine can be swung right or left. Some provision for wire lengths must be made so that things don't have to be disconnected. When I measured my hinge bracket, I noted a possible problem for straight or anhedral wings (I have dihedral in mine). The lower bracket attachment to the firewall must be accessible on the rear for the nut and washer attachments so this must be considered before building this mount. I made my parts out of aluminum because I had the stock and welding rig available at work. 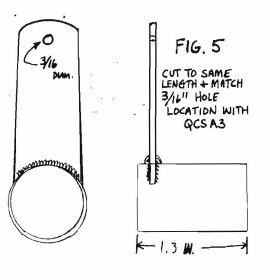 Make CS2 from 3/4" x .035" 2024 tube. The length is determined from your particular installation. 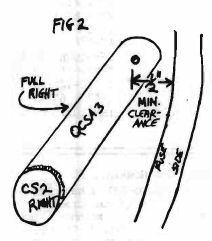 The center of CS2 Right should be located 1.8" inboard of the right fuselage side at the front and exit through the seatback bulkhead as far inboard as possible to allow for proper travel. See fig. 1. Bend QCSA1 Right approximately 20 degrees to the left to allow clearance when full right aileron is applied. It may be necessary to clearance the fuselage side to allow full left travel to QCSA1. If needed, dig out foam from the fuselage side and glass it over with a 2 BID patch. When mounting QCSA3, cut off 1 ear and mount with a half inch clearance between the center of the rod end bolt hold and the fuselage side when full right aileron is applied. See fig. 2. Install phenolic bearings on seatback bulkhead for CS2 and CS2 Right. Drill hole to match angle of seatback. Flox in place and cover with 2 BID. See fig. 3. 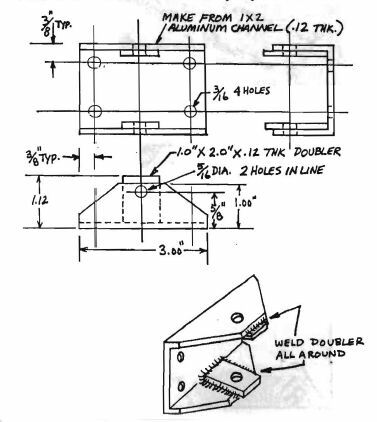 Make center bellcrank from 7/8" x .058" 4130 and 3/4" x .080" 4130 steel. See fig. 5. Install center bellcrank over CS2 and install in parallel position with center stick. Cut 1/2" x .035" tubing to proper length. Mount rod ends and install as per figures 1 and 3. Make center support bearing from white foam. Cover with 2 BID and finish with glass-to-glass edges. Make phenolic bearing and install with 2 BID. 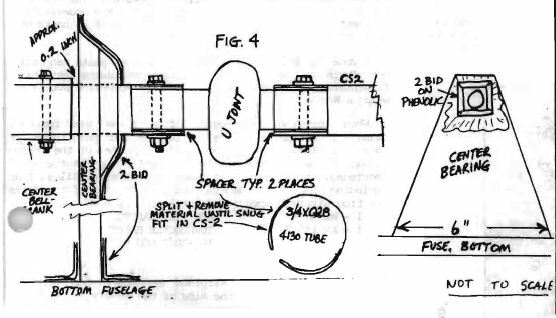 Slide over CS2 approximately 0.2" from center bellcrank and flox to fuselage bottom. Lay up 2 BID, overlapping 1 inch each way. 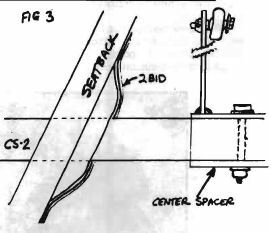 If you have a reflexer, cut CS2 one inch aft of the bearing and install a U-joint to prevent any binding when the reflexer is used. Split a 3/4" x .028" 4130 tube for spacer material between CS2 and the U-joint. See fig. 4. Make elevator bellcrank from 13/16" x .095" 4130 tube and 1/8" x 1" 4130. See fig. 6. **NOTE: If your elevator balance weight is located outboard on CS20, you may weld directly to it and omit the 13/16" tube. Mount the elevator bellcrank on CS20 about 0.2 inches from the bearing. 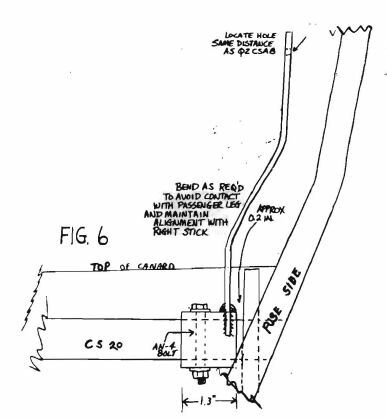 Make sure full elevator travel will be allowed before drilling the hole through the tube. Mount with an AN4 bolt. See fig. 6. Cut the 1/2" x .035" tube to the proper length. Mount rod ends and install. **NOTE: Make-up and installation is the same as for the center stick. IMPORTANT: CHECK ALL CONTROLS FOR BINDING, CHAFING AND PROPER TRAVEL. DO NOT FLY UNTIL EVERYTHING IS PERFECT. CHECK SECURITY OF ALL BOLTS AND HARDWARE. HAVE FUN! 2"-13/16" x .095 4130 tubing 1-AN4-14A bolt *NOTE: If you can-not purchase theseparts, or elect notto, you will need to order materials tomake them. Buildidentical to originalsexcept for bend in QCSA1 and 1 ear onlyon QCSA3. On my Q-200 I have had some problems with my aluminum spinner backplate cracking. The first one cracked at the radius of the spinner (sketch A) after about 15 hours of flight. I called Bob Irwin at A.C.S. (Aircraft Spruce's manufacturing arm) and he seemed to be aware of the problem. He said that they made the radius too sharp and sent out a new backplate (no charge). The new backplate had a more rounded bend in it and was made of slightly thicker metal. I installed it, but it lasted only 7 hours. It cracked just outboard of the propeller extension hub. I sent that backplate back to A.C.S. and they were quite puzzled by the problem. Mr. Irwin said that he hadn't seen anything like it, and Scott Swing said the same. Even though the spinner tracked true, it looks as though there is some wobble somewhere, which causes flexing, and results in cracking. To shorten a long story, A.S.C. tooled up and made a frontplate as described in the Tony Bingelis book "Firewall Forward". 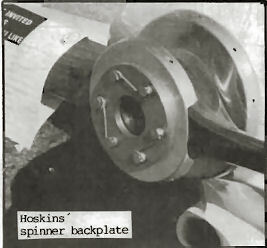 The spinner is screwed to the frontplate and prevents any undesirable movement of the spinner. So far, with about 25 hours on this setup, it is as solid as a rock. Anyone interested in obtaining a front plate can call Bob Irwin at (602) 855-8613. Please be aware that this frontplate is sized for a 3.5" thick propeller hub (I'm using a Warnke). When carrying passengers, I found a real need for roll trim. I decided to use the elevator push tubes for this. I installed a turnbuckle in one of the torque tubes, to allow the control length to be lengthened or shortened, as needed. It seems to work very well so I am including the part numbers that I used. All of the parts are from Aircraft Spruce and total about $16.00. When you fuel the airplane and put in too much, the excess will run down the side of the fuselage. Also, if you have a full tank and the plane heats up in the sun, fuel will expand and leak out of the filler. I installed an aluminum overfill line, next to the filler cap, and ran it out the bottom of the fuselage. This keeps fuel stains off the fuselage. Until recently, the best indicated airspeed I've seen in level flight was 191 mph at full throttle, at 2500'. Last week, I found that by putting in a lot of elevator nose down trim and my reflexor full up (about 1/2"), my airspeed instantly increased to 196! This leads me to believe that I may be able to pick up more speed by fooling around with trim and rigging. This also demonstrates the importance of wing to canard angle of incidence. If my incidence was dead on, maybe I wouldn't need the reflexor to compensate and the ailerons would be set at neutral. At Oshkosh I talked to a builder who used a laser to line up his waterlines and he came to the conclusion that the waterlines depicted on the templates are wrong. Unfortunately, us builders don't seem to have a reliable way of checking this against a standard, other than trial and error. I heard that Bob Walters at Dragonfly is offering, to Dragonfly builders, free use of an angle of incidence jig to set the proper relation between the two wings. He told Dragonfly builders at his Oshkosh forum that they shouldn't even attempt to accomplish this task without the jig and that it will make a terrific difference in performance. It would be nice if we had something like that. How fun it is! I'm approaching 250 hours on my Q-200 and I'm constantly jazzed by it! It is still Fun, Fun, Fun!! I have flown in formation with an Ercoupe, various Cessna's, Pipers, and a German Junkers JU-52 tri-motor! One of the most fun things is "shooting down" spam cans. When flying in formation with friends in their slow birds, I'll pull ahead of them and make a climbing 360 degree turn to gain a little altitude on them, then swoop in from behind. When I'm passing them at 200 mph they all look like they're standing still! It's a good thing there's no room for machine guns! Keep building, it's all worth it! I've been giving a lot of people rides, so I bought a blank paper "guest book" at a stationary store. After I give someone a ride, I have him or her sign my guest book and write a note about how they liked it. Their comments are great to have, and years from now it'll be a nice record to have of these fun times. I am writing you to inform you of an incident with one of our Tri-Q's. The incident occurred while the aircraft was making a landing. The best we can determine, the nosewheel started shimming right after touchdown, the pilot attempted to raise the nose wheel off and the wheel turned all the way around striking the propeller. The pilot managed to complete the roll out and taxi off the active runway with the engine stopped. There was no damage to the airplane other than a broken propeller. The problem was the controller on duty decided to report the incident. The aircraft caused no delay of traffic. (An airliner took off as soon as the Tri-Q cleared the runway.) To make a long story short the FAA decided to find a remedy to keep the nose wheel from pivoting 360 degrees. They inspected all five of our Tri-Q's and then grounded them until a stop is installed on the nose wheel pivot. I think it will be mandatory on all Tri-Q's. This Tri-Q had about sixty hours flown by Ron Whetsten and myself. At the time of the incident the aircraft was being flown by the owner and it was only his fourth landing in the aircraft. It was not a good landing and he probably touched down too fast and let the nose wheel down too soon. Also we found the nose wheel to be way out of balance, which may have caused the wheel to shimmy at high speeds. The wheel has been balanced, a nose wheel stop has been installed, a new propeller installed and the aircraft flying again. James H. Langley, 245 E. Kimberly St., Republic, MO 65738 (417) 732-1143. I've sketched a very crude cut at how to measure the relative incidences between the wing and canard and the canard incidence relative to the ground plane. 1. Make female (reverse) templates for midwing/canard stations. 2. Slide the templates in place. 3. Raise tail until wing bubble is level. 4. 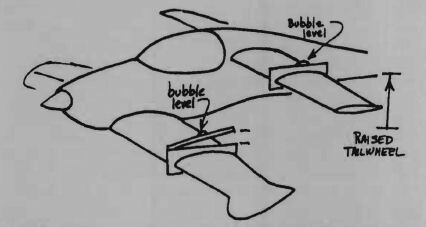 Raise adjustable part of canard template until bubble is level. Measure gap height and you can calculate the angle of incidence between wing and canard at the midspan point. 5. With a pilot in the seat and the tailwheel on the ground, level the canard adjuster and read the takeoff angle of incidence. 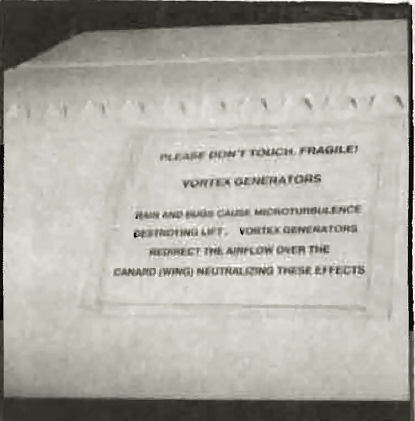 Schnackel used this trick to keep some Oshkosh gawkers' mitts off of his vortex generators. Enclosed also is a picture of my panel layout. I tried to arrange it as "ergo-metrically" as possible, putting all controls at left or right hands (no crossing arms on short final) and placing for ease of maintenance. This is an area of weakness for most; some are real maintenance nightmares. All of my "fixed" controls are on the sub panel, so that the panel can be removed without undoing any cable or fuel connections. The wiring is arranged so that the panel can be removed and placed aside for quick access, and with quick disconnects for total removal of the panel (exception mags). If I had to do it over again, I would make my sub panels as large as possible to provide more fixed space for air vents and other creature comforts. I have installed 4-way electric trim and a PTT switch on my center stick, backup switches on the panel. My pitch trim motor is heavy and over built for what I need so I have about a 1 lb. penalty total. With a lighter motor, it would only be a few ounces. The pitch trim motor drives the "stock" trim wheel with a friction drive that doubles as the friction lock, so it can be manually overridden at any time. The roll trim tab is in the left main wingtip fairing, and is sized for about +/- 5% roll authority. I spent a lot of (wasted) time getting tolerances on the canopy tight. This is a mistake, since after paint, the canopy fit is too tight, and I have no room left for weather stripping. Look at a car door - the outer skin is flush and tight tolerances, but there is a huge cavity inside for about 2" of rubber seal. Next time I'll take the hint from the boys in Detroit. Enclosed also information on the stock Revmaster spin on filter and possible automotive replacements. Based on what I've learned, I plan on using the Chrysler 2.2 Liter engine filter (FRAM #PH3614). The Revmaster replaceable element spin on weighs 1.9 lbs compared to 0.5 for the FRAM. In addition, the FRAM will contain about 50% less oil during use, resulting in about a 2 lb net reduction. Both are full flow bypass filters, but the FRAM has an anti drain-back valve to keep the filter full during shutdown. This is to minimize wear on cold startup especially on newer overhead cam 4 cylinder engines, where there can be a substantial delay in getting oil flow to the cam lobes before the oil heats up. The cold oil is initially thick (low viscosity) resulting in high-pressure drop across the filter. The oil bypasses the filter (increasing flow) until the oil heats up and thins out allowing the bypass valve to close, resuming filtration. Both devices help minimize wear during cold start. Anybody want to lose 2 pounds of ugly weight off your nose? Some guys are finding out that the pushrods from the control stick to the elevators won't clear the gas tank. Mine didn't and I couldn't see cutting up the tank to put in a channel for them. I wondered if I could bend them...answer...yes! I'm sending an exact tracing and as you can see it's got quite a bend without any kinking. I ordered some 6061 aluminum tubing to practice with and got pretty good at using a vice and pieces of wood contoured to avoid kinks. You just take it a little at a time. I also wondered if a bent pushrod would fold under considerable pressure. The 6061 tubing did flex a bit and I wasn't confident enough so I ordered some 20-24 T6 and bent it. It is surprisingly strong. Not as strong as a straight tube, of course, but strong enough that I think something else would break first (a pivot or something) before the tube collapsed. I've installed them, they work fine, but of course, I haven't flown yet. I was very glad that someone got the address and phone number of the guy with the 0-235 in his Q-200. I called Bill Elliot and he had some very interesting things to say about it. His wing and canard have FOUR extra layers of UNI cloth, his whole aft tail section has been beefed up, and the rudder and vertical stabilizer were redesigned for more control. According to him the mating of the 0-235 was not all that difficult. He did have to modify the Q-2 cowling so that the cylinders would fit in properly. His engine is an 0-235C which weighed only 4 pounds more without the starter. It's about time for some general comments from the Q-2 fliers concerning propeller performance. I was using a DeMuth prop of 56x44 and cruised at 145-150 IAS. DeMuth then sent me a 54x48 to try and my cruise went up to 150-155 at 2800-3000 rpm. Note, though, that I've made some rewiring adjustments on my tach so my indicated data could be somewhat questionable. I promised a progress report on how I adapted a "pull start" engine to my airframe. My objectives were to make the pull start mechanism fit inside a more or less standard-sized mag box and to easily connect/disconnect the pull cable from the starter before engine removal. This was relatively simple (see photos). The actuator arm was remounted on a special plate below and left of the starter, allowing it to extend forward out of the mag box for access. I configured the box based on engine dimensions given in Continental's repair manual. To operate the starter once the drive gear is in place, I plan to use a micro-switch and starter solenoid activated by the pull start arm.